Seljalandsfoss, another breath-taking waterfall in south coast of Iceland. This waterfall is very difficult to miss as you will notice it while driving along the Ring Road. It is very popular among the tourists, and is always crowded with tour buses and cars. Many Icelanders choose this location as a wedding photography venue as well or even to exchange vows. Another main reason it is particularly very popular as it allows people to able to go behind the waterfall on a well developed trail. During the winter months with days short, we arrived at Seljalandsfoss after sunset. It was windy, cold but a clear night. And this waterfall is lit up during the night, and it looked wonderful. You could see water flowing down like a cotton candy from the height. It was a mesmerizing moment. And of course Ash was happy, he wanted that we should reach at this waterfall once it starts to get darker. Why? So that he could take some beautiful pictures of the falls. Unfortunately we could not walk behind the falls this time as it was too cold and we were sure to get wet if we walked behind it because of the force of the wind. Frankly I did not want it either as I was freezing from cold, temperature was around 0 at that time. 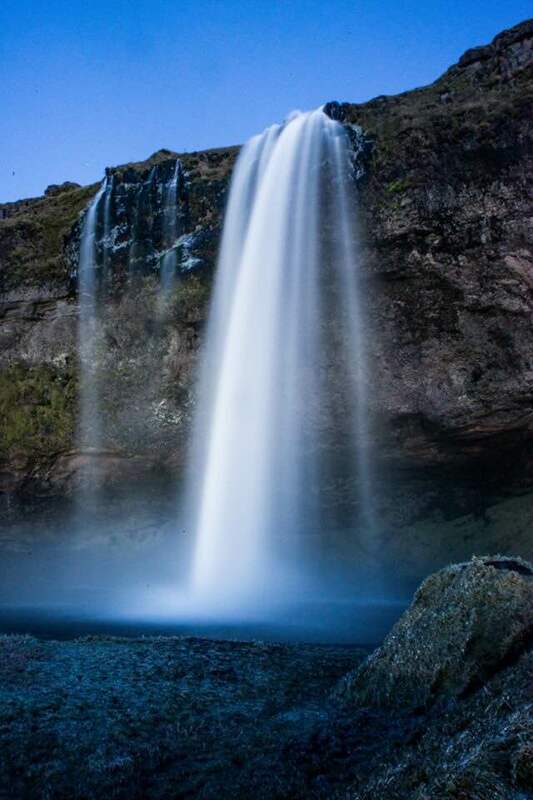 Like many other places, I had to look for Seljalandsfoss meaning as well over the internet. What I found is, Seljalandi meant ‘Seller’ and Foss meant ‘Falls’, so we can call it Seller’s Falls. Interesting isn’t it? Its beautiful Aanchal 🙂 Keep up the good work! Simply beautiful.. As you mentioned it’s definitely breathtaking.. Wish I get a chance to see it.. Thank you Shru. I am sure you would see it soon 🙂 Plan a trip this summer, Vihaan is 1 now 🙂 You guys going to fall in love with Iceland. I’m never tired of seeing waterfalls like this ! Some excellent pictures! And a good read! Thank you. We are planning on a trip to Iceland ourselves and have been looking for help and advice from other bloggers. We would appreciate if you could leave any advice on our post so that we have as much to blog about as possible when we go. Our post about Iceland is https://thiscouplewent.wordpress.com/2016/02/07/iceland-the-planning-begins/ . If we manage to do something you suggest then we will post a link on our blog to yours. It would be nice if bloggers could help each other out! Interesting! Love the translations. Thanks! Wishing you a great weekend, Aanchal!